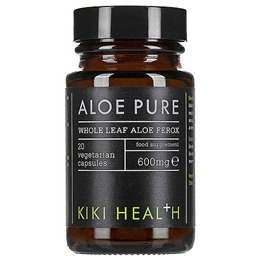 KIKI Health Aloe Pure Freeze-Dried Whole Leaf Aloe contains active enzymes to help break down and dissolve foods. The yellow gel contained inside the leaf has been used for thousands of years. Aloe Pure contains freeze-dried whole leaf aloe, grown hydroponically with water. 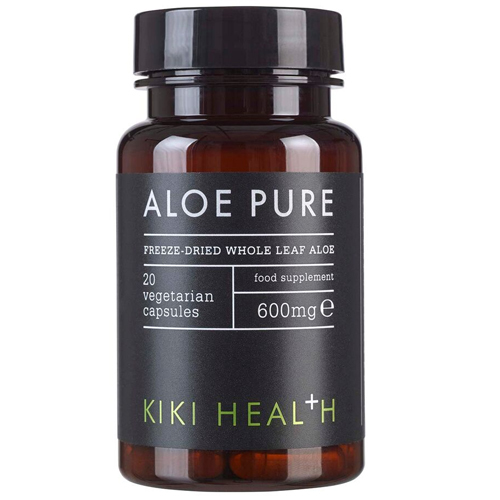 KIKI Health Aloe Pure does not contain artificial colours, preservatives or sweeteners and is suitable for vegetarians, vegans and those who are lactose intolerant. KIKI Health was born out of a desire to promote optimum health and well being. The product diversity is based on the overall power to cleanse, detoxify, heal and nourish. The brand encompasses a range from green superfoods to natural beauty products. Adults intake one capsule with an evening meal for an overnight cleansing. Maintain one capsule daily for 2 to 4 days, then continue as needed. Do not take more than one capsule a day. Do not use Aloe Pure if you have regular bowel movements or if you have diarrhoea. Below are reviews of KIKI Health Aloe Pure - 20 x 600mg Vegicaps by bodykind customers. If you have tried this product we'd love to hear what you think so please leave a review.